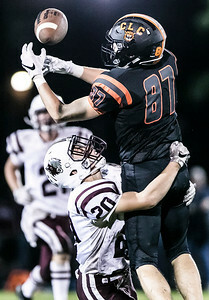 Sarah Nader - snader@shawmedia.com Prairie Ridge's Justin Mikolajczewski (left) takes down Crystal Lake Central's Christian Crociata while he reaches for a pass during the third quarter of Friday's game in Crystal Lake September 9, 2016. Prairie Ridge defeated South, 48-14. 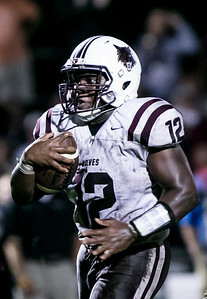 Sarah Nader - snader@shawmedia.com Prairie Ridge's Emmanuel Ebirim scores a touchdown during the third quarter of Friday's game in against Crystal Lake Central September 9, 2016. Prairie Ridge defeated South, 48-14. 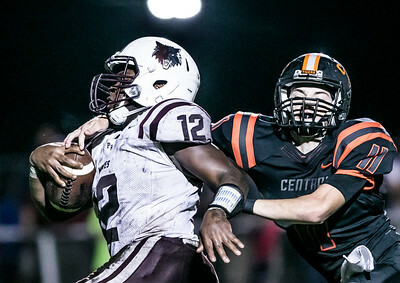 Sarah Nader - snader@shawmedia.com Prairie Ridge's Emmanuel Ebirim (left) is held back by Crystal Lake Central's Christian Mitsven before he scores a touchdown during the third quarter of Friday's game in Crystal Lake September 9, 2016. Prairie Ridge defeated South, 48-14. 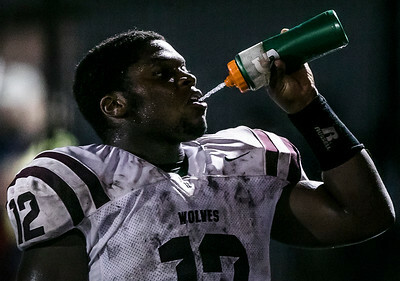 Sarah Nader - snader@shawmedia.com Prairie Ridge's Emmanuel Ebirim taks a water break during Friday's game against Crystal Lake Central in Crystal Lake September 9, 2016. Prairie Ridge defeated South, 48-14. 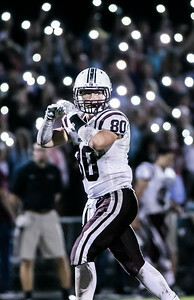 Sarah Nader - snader@shawmedia.com Prairie Ridge's Samson Evans scores a touchdown during the third quarter of Friday's game against Crystal Lake Central September 9, 2016. Prairie Ridge defeated South, 48-14. Sarah Nader - snader@shawmedia.com Prairie Ridge's Austen Ferbet during the third quarter of Friday's game against Crystal Lake Central September 9, 2016. Prairie Ridge defeated South, 48-14. 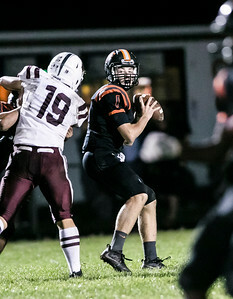 Sarah Nader - snader@shawmedia.com Crystal Lake Central's Jacob Staples throws a pass during the fourth quarter of Friday's game against Prairie Ridge in Crystal Lake September 9, 2016. Prairie Ridge defeated South, 48-14. 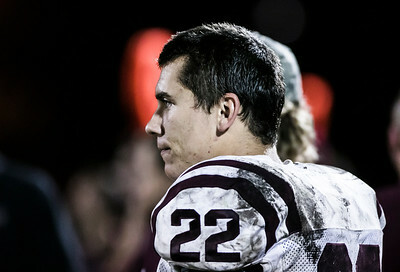 Sarah Nader - snader@shawmedia.com Prairie Ridge's Samson Evans sits on the sideline during the fourth quarter of Friday's game against Crystal Lake Central in Crystal Lake September 9, 2016. Prairie Ridge defeated South, 48-14. 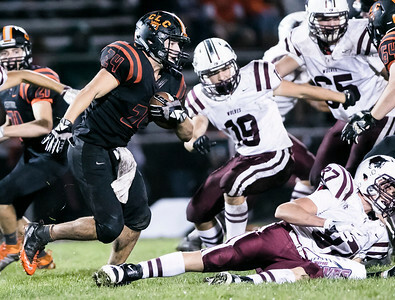 Sarah Nader - snader@shawmedia.com Prairie Ridge's Matthew Grant runs the val during the fourth quarter of Friday's game against Crystal Lake Central September 9, 2016. Prairie Ridge defeated South, 48-14. 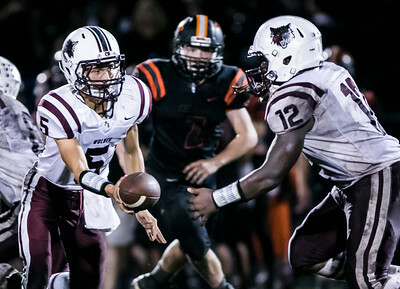 Sarah Nader - snader@shawmedia.com Prairie Ridge's Trevor Potter (left) passes the ball to Emmanuel Ebirim during the fourth quarter of Friday's game against Crystal Lake Central September 9, 2016. Prairie Ridge defeated South, 48-14. Sarah Nader - snader@shawmedia.com Crystal Lake Central's Vinson May runs the ball during the fourth quarter of Friday's game against Prairie Ridge in Crystal Lake September 9, 2016. Prairie Ridge defeated South, 48-14. 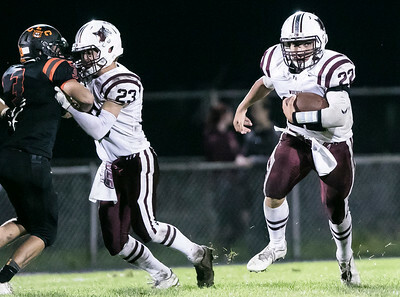 Prairie Ridge's Justin Mikolajczewski (left) takes down Crystal Lake Central's Christian Crociata while he reaches for a pass during the third quarter of Friday's game in Crystal Lake September 9, 2016. 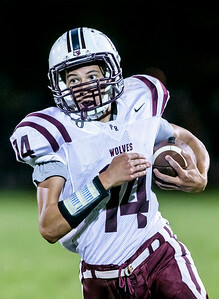 Prairie Ridge defeated South, 48-14.